and their communities in outback central Australia. The Watarrka Foundation is committed to the creation of thriving, independent and self-reliant aboriginal communities living on their ancestral land. We aim to achieve this by working directly and collaboratively with like minded organisations. Focussed on young people, we deliver programs that support a sustainable environment, education, healthy lifestyles and independent livelihoods for Aboriginal communities in the Watarrka region. Our aim is to develop leadership values amongst the children, so as to create the leaders of tomorrow, who are inspired to care for their legacy and that can show others the way. the Foundation has a successful track record of delivering a wide range of projects in the area. Imagine if every Indigenous child could receive a high school education - even in the remoteness of Australia’s Red Heart. 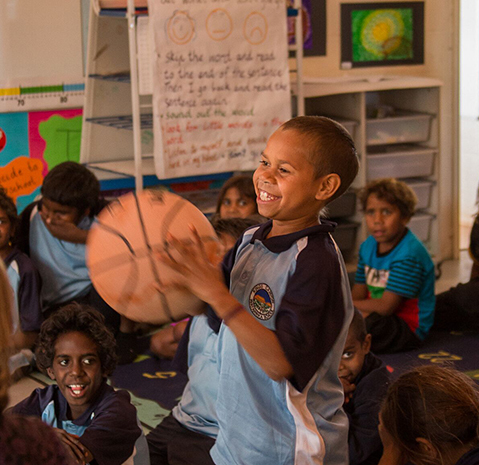 For many Indigenous students reaching year 7 means leaving their community, and heading to a totally alien environment, to continue their high school education. Without the support of close family and friends, life in the unfamiliar environments of large cities and towns can break the hearts of many young Aboriginal students. Many give up on their education and return defeated to their home communities. A tragic loss to the potential of the child, a tragic loss to Australia. The Watarrka Foundation (formerly Lilla Foundation) could not have delivered such a successful event and enriched the lives of so many outback kids if not for the incredible enthusiasm and generosity of its supporting organisations such as Gadens, The St George Foundation, Westpac, NASCA, Poetry In Action, NT AFL, and Have a Ball Foundation.